Ahead of the sequel to Hot Tub Time Machine being released in the UK, hot tub retailers share their views on what they would do if they could turn back time to alter their destiny? After Hot Tub Time Machine first hit our cinema screens in 2010 it quickly achieved cult status. It also provided hot tub retailers with an additional marketing tool to boost their showroom sales. In the film a group of friends led by Adam (John Cusack) get sent back in time to the Kodiak Valley Ski Resort resort they visited in the 1980’s. The second instalment from Paramount Pictures sees Nick (Craig Robinson) and Jacob (Clark Duke) fire up the hot tub time machine after Lou (Rob Corddry), who has used his time travelling exploits to create a form of Google, gets shot. Originally the sequel was scheduled for a December 25 release date in the USA but was put back until February 20, while UK audiences have had to wait even longer until today when it hits cinemas on its opening weekend. 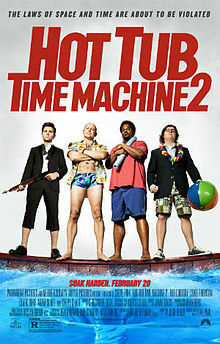 USA Today reported that during the film’s February premier in Los Angeles, it was claimed that there had been suggestions of the film being called ‘Hot Tub Time Machine 3’ as an insider joke relating to the time-travelling plot that sees the tub go to the future this time round. In the article by Carly Mallenbaum, it is also reported that the correct title convinced Bianca Haase, who plays Sophie, to adopt the role of Jacob’s love interest in the sequel. Highlighting his thoughts on the appropriate etiquette for hot tub use Craig Robinson declared that you should always acknowledge other users in a communal tub. “You shower and wear flip flops and you have a robe on all the way until you get in and you greet people,” said Craig. We asked hot tub retailers what they would do if they had the opportunity to simply jump in one of their showroom’s hot tubs to turn back time? While many hot tub dealers would consider changing certain elements of their lives and businesses, other retailers say they are happy with their current progress and so would not wish to turn back time. Multi-brand hot tub and swim spa specialist Jennifer Angood at Hot Tubs at Home says she would not need a hot tub time machine to alter her destiny, because she believes the experience she has gained in the wet leisure industry has given her the knowledge to achieve outstanding success as a hot tub retailer. The Coast Spas, RotoSpa, and Softub specialist dealer, is convinced that the decisions she has made within her thriving showroom have all helped to benefit her dealership. Earlier this year she landed a clutch of prestigious top awards from Coast Spas including the brand’s highest European ‘Outstanding Customer Service’ accolade recognition. During the Coast Spas International Dealer Seminar in Vancouver, which had a record attendance and was boosted by visiting UK hot tub retailers, Jennifer came out top in the whole of the brand’s European network to land the ‘Outstanding Customer Service’ Award and was also ahead of other global retailers to achieve the ‘Outstanding Growth International 2014’ Award. “I wouldn’t go back in time,” declared Jennifer; “At the moment my view is firmly that I wouldn’t change a thing. Everything happens for a reason. “The knowledge that I have picked up about other brands has helped me to become a much better sales person. It has given me a really good foundation. I’m glad that I’ve done things the way I have with plenty of brand experience because it’s given me greater awareness about what works and what doesn’t. “Our intention all along was to build the business on a strong financial basis. Over the years we’ve never had large debts hanging over our heads while we’ve been growing and that is still the case today. “We never wanted to extend ourselves beyond our financial limits and so we started slowly and kept our overheads low. We currently have a large display of models and now own all of our hot tubs and are debt-free. Jennifer also highlighted that she wouldn’t reverse her decision to become a Coast Spas retailer, which she took in April 2009. Jennifer believes the move to introduce the manufacturer’s eye-catching range to her showroom has paid off. She believes that retailers should look for brands and suppliers with unique features to enhance showroom displays if they are missing the ‘wow’ factor. “It’s great to have something different in your showroom line ups and bring in some unique designs,” says Jennifer. “The decision to supply the Coast Spas range has been a good one and it works really well for us in this area. Jacuzzi, Viking Spas, and Villeroy & Boch dealer Donald Mackingtosh of Pool & Spa Services by DFM Design is another retailer who has declared that he would not require the capabilities of a time machine. With three strong brands, combined with his pool services experience, Donald believes he has the recipe for success in the wet leisure market linked to his business associations with builders, designers and architects. “The beauty of having such reliable brands as Jacuzzi, Viking Spas, and Villeroy & Boch is that I’m rarely required to carry out warranty work,” says Donald. “So that gives me more time to sell hot tubs and also to conduct meetings with potential customers. Donald also believes his decision to have a number of revenue streams linked to the wet leisure market has helped to secure his financial stability. “I’ve been lucky in the fact that I’ve been able to build the business with a lot of different revenue streams,” says Donald; “If one aspect of the business goes quiet then I can usually rely on other things to keep me going. “I’ve got a really good relationship with a number of builders and architects that I can get involved in for big projects that include swimming pools, hot tubs and infrared saunas. “It’s a specialist service and I like that kind of bespoke work. The beauty is that it is very good revenue and I don’t have much competition for it in this market. “That’s because the majority of traditional hot tub dealers will not have the experience or the desire to do all of the necessary essential ground work with the builders and their customers that has to be covered very professionally before the final decision making process is completed and contracts are agreed. “So if I land some of those contracts it sets me up nicely, while additional sales from my Jacuzzi, Viking Spas, and Villeroy & Boch models are ticking over. All of these brands provide me with good products to sell to my customers. Donald has no regrets when it comes to his decision to provide his customers with the choice of options from three quality manufacturers. “Consumers are seeking out quality products and if you don’t have any in your showroom you will miss out on this high-value element of the market,” says Donald. “That’s a shame, especially as the economy is improving and people are spending their money much more freely. Marquis retailer Sue Jenkins of Cheshire Spas and Swimming Pools would certainly turn back time and instruct herself to gain extra insurance for her business. Decades apart, Sue has been hit by fires that have blighted her business during the relocation period. Four years ago the garden centre in Wilmslow where Sue was previously located burnt down but her own showroom area was unaffected. So Sue revealed that the dealership, was unable to claim on its own insurance for fire damage, even though it had to be relocated to another garden centre during the rebuilding process. “We were fully insured for our business but we didn’t have loss of footfall insurance that we could have claimed on while we were suffering loss of earnings due to our business having to transfer to another site,” said Sue, who is currently promoting the new Aquatic Training Vessel (ATV) from Marquis that was showcased at the UK Pool & Spa Expo and SPATEX this year. They say that lighting doesn’t strike twice, but nearly 30 years ago Sue suffered another fire blow while running a market stall with her ex-husband in Liverpool. A devastating fire in the market hall resulted in all of the stall holders being hit and having to be relocated into temporary units after their previous location had completely burnt down. “Along with all of the other market stall holders, we were relocated to temporary units while the market was being rebuilt,” revealed Sue; “Both of these fires that hit our business were due to electrical faults. So it wasn’t anything to do with us, but we lost out. Last year RotoSpa Sales Director Jason Smith celebrated his tenth anniversary in the industry and says he would take the opportunity of turning back time to increase the production capacity for the British manufacturer. In recent years the West Midlands-based factory has ramped up its production to achieve 32 per cent sales growth and Jason believes with hindsight he would want to take other opportunities to improve capacity. “When you’re building up a company you never really know when the best time is to expand production, but if I could go back in time I would create more capacity for our hot tubs much sooner than we have done,” said Jason. Spa Crest retailer Tracy Roberts has no hesitation when asked what she would do if she could turn back time. Tracy and her husband Tony have introduced the Spa Crest, Coastal, and Vision ranges of hot tubs from Spa Crest Europe to their Shropshire Pools and Spas showroom. Now Tracy wishes she could go back in time to introduce the USA manufactured product range much sooner. “Introducing the Spa Crest, Coastal and Vision ranges has had a huge impact in our showroom,” revealed Tracy. “If I could turn back time, I would certainly tell myself to take the action in bringing Spa Crest on board much sooner. Award-winning Jacuzzi retailing specialist Mike Robinson, who is Managing Director at Euphoria Lifestyle and currently promoting the new Jacuzzi J-500 hot tubs, would transport back in time to gain additional showroom floor space. If he could turn back the clock, Mike says that he has no hesitation in targeting the infancy of his dealership for time travel, during the period while he was negotiating the original contracts with his landlord ahead of launching his showroom. “We have grown our business carefully and incrementally over the last nine years, and gone from strength to stability by delivering a quality product and service from the outset,” said Mike. Mike, though, says he would not want to change any of his retailing philosophies that have helped him secure success with the Jacuzzi range of products during the years of being associated with the USA manufacturer. “If there was one thing I am absolute in having gauged correctly is that you choose your target marketplace and be resolute and absolute,” said Mike. “We have been selling the same brand for years, whilst so many around us seem to just swap brands year-on-year. This, in my view, simply confuses the customer. 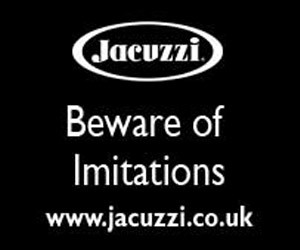 “Our loyalty and efforts have paid off with the Jacuzzi brand. We deliver a consistent message of quality and service, which is irrefutable and pays dividends in the long term. Beachcomber, Garden Leisure and RotoSpa retailer Hazel Gardiner of RelaxaTubs would certainly go back in time and convince herself to concentrate on quality hot tub sales and not to chase cheap spa prices. “If I could turn back time I would tell myself not to get so hung up on the price of hot tubs,” said Hazel. “In the early days everyone was so fixated on low prices to try and get more sales than everyone else. “Knowing what I do know, though, I would have been much better to have always concentrated on promoting quality hot tubs rather than worrying about what was happening in the market with the prices of cheap Chinese imports. “Now I realise that quality goes much further than the low-priced cheap options. That’s why I would rather sell quality in less numbers than lots of cheap hot tubs. “With quality brands you are going to gain satisfied customers that will upgrade in the future and this is the correct strategy for providing long-term profitability in this market. “We’ve never had a single negative comment from our Beachcomber customers for example. After choosing some of the lower priced models and using them regularly for a few years many of our customers have then come back to us and upgraded to a higher-priced Beachcomber model because they want to gain the additional benefits. “A lot of people are now upgrading from their previous cheap hot tub models. So the message has started to get through to consumers on this side of the market. Jacuzzi and Spa Crest specialist dealer Franklin Hill of Malibu Hot Tubs, who also supplies the flourishing range of British-built CedarTree hot tub gazebo and swim spa enclosures that are promoted by over 100 dealers in the UK, wishes he could turn back time to make the move to his current showroom’s location much sooner to reap the rewards. Following the move to his showroom alongside a busy dual carriageway near Stone, Franklin has achieved improved sales for his two USA manufactured hot tub brands. “It’s been a good move relocating to this showroom and I now wish I could turn back time and do it sooner,” said Franklin. Andy Lane of Oasis Hot Tubs, who supplies MAAX Spas and California Cooperage hot tubs, says he is feeling positive about the future and is not worrying about altering the past. Andy originally started out in the industry by renting out hot tubs in 2005 before progressing to become a fully-fledged hot tub retailer with a number of brands ahead of securing his current range of options. In recent years Andy has improved his showroom facilities at the Rushfield’s Plant Centre to help capitalise on increasing customer demand. “I don’t really need to turn back,” says Andy; “I came into the industry during the recession before the time when hot tub sales were supposed to be really booming. “It’s not been all honey and roses and I’ve had to battle through the difficult times in recent years to get to where we are today in a more positive mood. “At the moment things are improving all of the time with the economy and people are spending again. I certainly wouldn’t want to go back in time to 2012, because that was an awful year for me with poor sales. “If things hadn’t improved then myself, and also many of the other retailers in the industry, would have probably gone out of business. “Thankfully consumer confidence has increased again. I’ve upgraded the showroom to include a dedicated indoor hot tub and sauna area. I’m now seeing the benefits of this with a lot of customer enquiries for our hot tubs.